What irks you most? Is it other drivers? Or the inhuman volume your husband chews food? 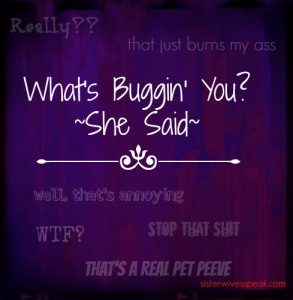 Head over to the Sisterwives Speak blog and see what some of your favorite peeps had to say on the subject, and feel free to tell us your pet peeves in comments! Here on The Sisterwives we cover some pretty heavy stuff. 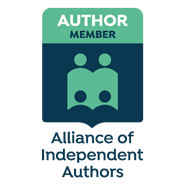 We appreciate all of our readers and are so very grateful to the brave and beautiful writers that submit pieces that they pull from the deepest, and sometimes darkest, parts of their souls. We thought that maybe today we would lighten things up a bit with a little help from some friends. Today some very funny people are stepping up and telling us what bugs them. I should say some very funny women. The fellas are on deck for Thursday! So sit back and have a laugh today. You’ve earned it! Kinda feel like I should follow that up with sum’n…I can’t remember if you wrote about your worst words in your section. I’ll leave my worst word here, cos I forgot to mention it in comments – clunge. HATE IT. Also i hate, hate, hate, HATE when people spit on the floor. It’s just SO GROSS. I keep thinking I’m done with stuff that bugs me, but each time I go to one of these feeder posts I think of more. I’m apparently far more irascible than I think I am. CLUNGE. I was totally thinking of that word yesterday!!! I don’t even remember why it popped in my head, but it did! Weird. hockin’ loogs is the grossest thing EVER. I can’t stand that nasally snort, and of course it’s even worse when it’s topped off with a spit. *snorks* WHY were you thinking of that?!?! Bizarre! Totes with you on the hockin’. Utterly, utterly GRIM with no excuse. People. Basically it’s all the stupid people, and sheeple, that piss me off. Yes. Sheeple. Right there with ya, buddy. You know what bugs? People who chew with their mouth open. UGH.